I had just been woken up at around midnight by very loud music coming from speakers that seemed to be just outside my bedroom. I jumped out of bed as if the fire alarm had gone off and peeping from the window I saw a small group of musicians with electric guitars and tambourines in the courtyard behind the hotel playing what sounded like traditional music amplified by huge loudspeakers. I couldn’t believe my eyes! What in the world was going on? 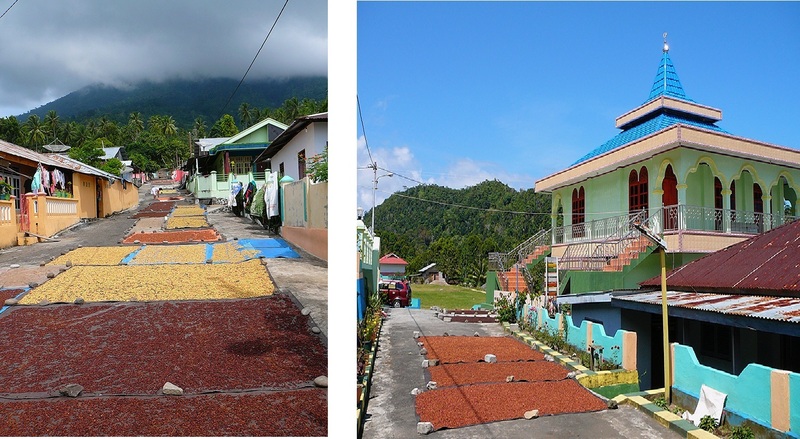 I was very tired because I had been traveling all day (flying from West Papua via Makassar and Manado) and had just arrived at the Indonesian isle of Ternate, one of the Spice Islands that rarely sees any tourists. 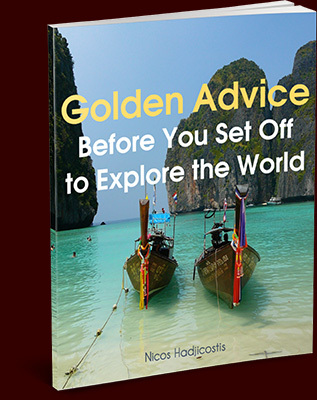 My exhaustion was amplified by a strange travel mishap: The local Indonesian airline had put my suitcase next to some leaking boxes – by the time I checked in to the hotel, my suitcase and many of my clothes smelled of rotting fish. Before retiring to bed, I made myself busy unpacking all of my clothes, hoping to air them out. With all of my things scattered around the room, the option of moving to another hotel was out of the question. The only thing I wanted to do was sleep. I ran downstairs to the reception to find out what was going on. The receptionist, who didn’t speak English well, muttered something incomprehensible and then said he would try to solve the problem. I had no idea what the “problem” was, nor did I have a minute to spend on finding out. My bed was calling me, so I went back to my room, hoping the receptionist would deal with it. After a few minutes, I noticed the volume of the music lower slightly, but it was still loud enough to penetrate my super-advanced earplugs. Nope, there was no way I could sleep unless the volume fell below my earplugs’ protective capacity. The whole affair was so annoying that I decided to take matters into my own hands, as I had done so many times before during my around-the-world-journey: I would go and confront the musicians. In the worst case, I could also call the police, who in my experience almost always sided with the foreigner. Half asleep and fully annoyed, wearing my shabby shorts, and naked from the waist up, I ran towards the courtyard to give my midnight battle with the Indonesian sound-polluting criminals. As soon as I arrived, I noticed that this was a gathering of young university students who seemed to be having a party in the neighboring courtyard. The young Muslim women were wearing head scarves, but otherwise were dressed in jeans and behaved as all students behave in the West. The men were playing guitars while two women sang, surrounded by about twenty other students, some playing tambourines. I asked if anybody spoke English, and started cupping my ears with my hands to show that I was a suffering tourist whom they had just woken up and who had come to complain. One guy who did speak English approached me with a big smile, while all the women, including the two singers, started giggling, wondering about this strange intruder. The young man explained to me that this was no party: They were simply practicing, and they would be leaving soon. I was not sure I understood why they were practicing in the wee morning hours, intent on rousing every single person (and every sleeping mosquito, for that matter) within a mile radius, but what I took away was that this whole charade would finish soon, and I could be back in bed. So, I decided to stay there for a while longer, in order to make sure they would all see my troubled miserable figure and feel my agony, in the hope of eliciting their pity so they would depart earlier rather than later. 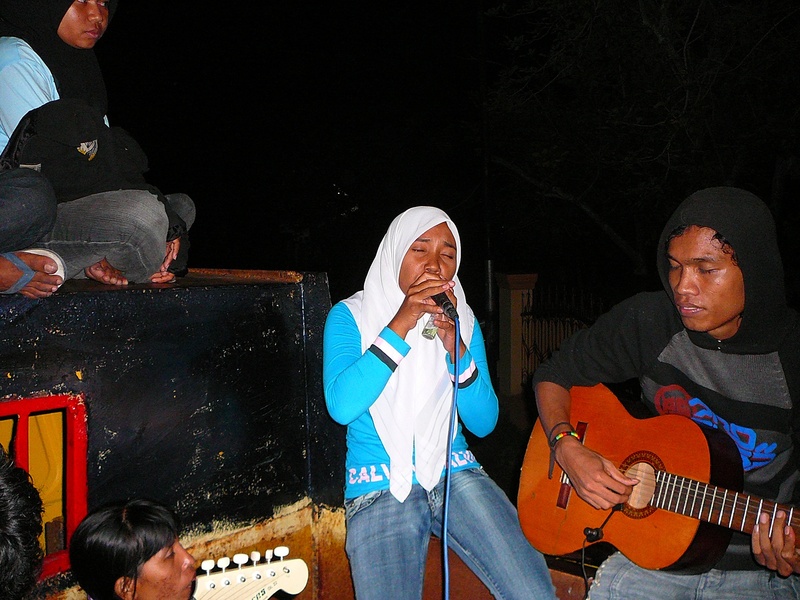 They gave me a chair to sit on, offered me something to drink, and continued with their music practice. The welcoming smiles and the friendly conversations started to have an effect on me. I realized that something quite special was going on. 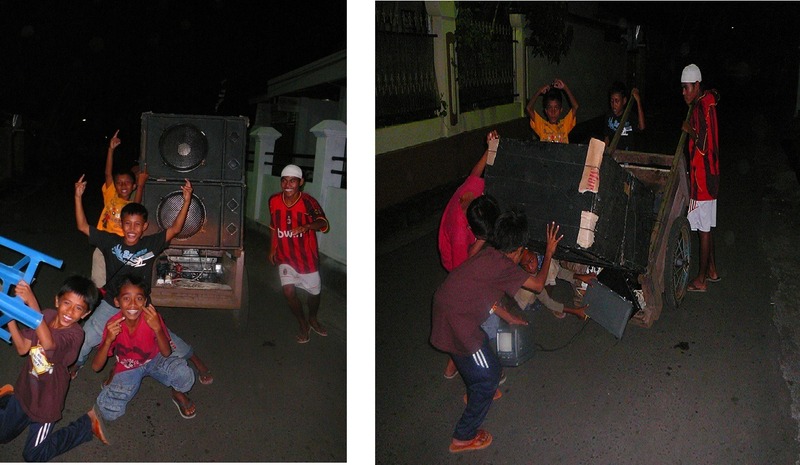 I quickly learned that it was the holy month of Ramadan and that all this was related to an Indonesian tradition called Gendang Sahur: The students would soon load their audio equipment onto the back of a pick-up truck before commencing to drive around the town and wake up, with their loud music, the Muslim faithful for the early morning meal, the sahur. During Ramadan, Muslims are not meant to eat or drink anything at all when the sun is up, so most people wake up in the middle of the night to have a big meal before the ensuing long day of hunger and prayer. As I surmised, young people throughout the country had taken up this job, and over the centuries had developed special songs for the occasion. These songs, called Qasidahs, have their origins in ancient Arabic poetry and differ from island to island among the Indonesian archipelago. Therefore, having been woken up was not only not an accident, but it was the students’ very mission! I just happened to be a non-Muslim whom they could not easily pick out from the general population for not waking up. As my anger gradually subsided and I befriended the “criminals” who had woken me, I began listening to the music more attentively. Then, something extraordinary happened: One of the electric guitars started playing an incredible solo piece between the lyrics, at a very high pitch, which reminded me of a Greek bouzouki. When the female singers, who had great voices, started on a song that seemed to be a merging of Greek, Arabic, and Indian melodies, I was entirely hooked! My earlier inability to hear this beautiful music was due to my self-centeredness and preoccupation with my own comfort. The moment I gave up resisting what was given to me, I realized that I was witnessing a true God-sent gift. The more the music drew me in, the more I discerned new harmonies I had never before heard. I was mesmerized. I suddenly felt like staying there all night. “When will you start driving around?” I asked. “Soon – would you like to join us?” replied the young student who was by now serving as my main translator. My instant response surprised me more than it did him: “What the hell, I will! I’ll be back in a minute!” I said, and ran back to my hotel room to dress properly for the occasion. When I returned, I had my camera in hand and managed to take some photos. A few minutes later, they stopped practicing and started loading the back of the truck with their equipment, along with a nice VIP chair for me, the honorary non-Muslim who had practically fallen from the fourth floor of the nearby hotel! 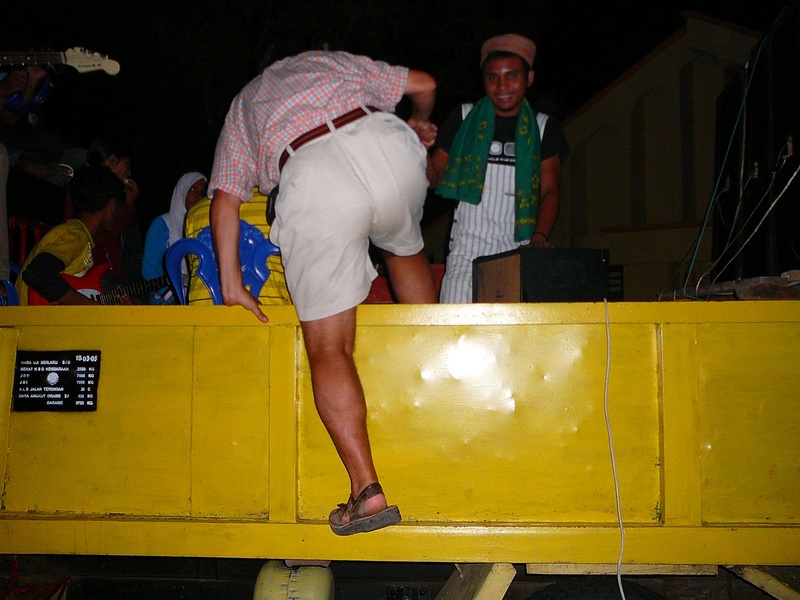 Before jumping onto the truck to join the group, I asked one of the youths to take a photo of the historic moment. As soon as we hit the road, the rest of the students who could not fit in the truck followed on their scooters. We were also joined along the way by other passersby, and in this way we ended up with a huge entourage. All the while, the students lovingly took care of me by offering me snacks and drinks, explaining what was going on, and answering my many questions. When we stopped at the first house, its welcoming residents greeted us with big smiles. Some joined in the singing, while others conversed with the students or offered them treats. What a festive occasion in the middle of the night! As we drove around town, we saw other troupes doing exactly what we were doing, albeit on a smaller scale — our truck was the real thing! Even elementary school kids created their own “kid-trucks” by using wheelbarrows. When one such group saw me taking pictures of them, they stopped to pose, forgetting to hold the wheelbarrow’s handles. Their contraption almost fell apart, but being immortalized on a foreign visitor’s film was worth it! The festive mood and joyous activities lasted until dawn throughout the town. The Sultanate of Ternate was established in the thirteenth century, and the long history of Muslim traditions was obvious every step of the way. The sense of mission with which the students performed what they considered their duty by custom, the devotion of the locals and their delicate interactions with the youth to which they showed the utmost gratitude, and above all, the ethereal otherworldly music that seemed to have been worked out and perfected over the centuries, had moved me deeply. Most importantly, the manner in which the events unfolded since I had been woken up, had an effect on the way I would continue to travel around the world for the next four years: I became even more open to the myriad surprises that lay hidden around me and more willing to embrace the present moment. When in the following days I would discover that the month of Ramadan that year coincided with the season during which the spices were collected and laid in the streets to dry all over the island, their scents filling the air – a fortuitous convergence of events that happens every 30 years or so! – I realized something even more crucial: that the universe is constantly conspiring to make my life even more magical than it already is. The only thing I needed to do was to stop being constantly focused on my own plans. From that night onwards, I would more readily stop and listen. And stop and smell – the spices.